osTicket is a widely-used open source support ticket system. Plain and simple it is a lightweight feature packed support ticket tool written mainly using PHP scripting language. 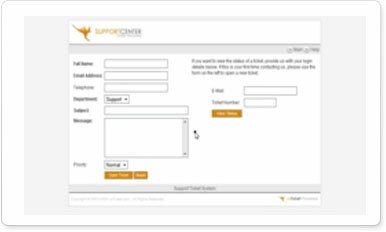 An attractive alternative to higher-cost and more complex customer support systems; simple, lightweight and easy to setup and use. The best part is, it's completely free. osTicket seamlessly integrates all tickets created via email and web-based form with a simple web interface. Easily manage, organize and archive all your support requests. Your clients will also be able to view tickets status and history online.